Brazilian Jiu-Jitsu is a grappling oriented Martial Art style with proficiency on ground fighting. Since the beginning, Brazilian Jiu-Jitsu was developed out of real fighting situations standing up or on the ground. In that regard the style was based on what is real instead of what could be real. Training and learning underlined this philosophy so techniques were not designed only for sports with rules, but instead techniques were designed to effectively address the actual tactics and strategies of a real fight using practical movements instead of flashy and theatrical nonsense. Brazilian Jiu-Jitsu prefers to bring an opponent to the ground and rely on grappling techniques to subdue the opponent using holds, armlocks, chokes, leglocks, and strikes. This strategy takes away the advantage of an opponent with superior striking abilities. It can also mitigate the advantage of a stronger and much larger opponent to rely on wrestling or grappling. For all Practitioners Brazilian Jiu-Jitsu offers a system of simple self-defense techniques that work whether you are big and strong or of a small frame. The principles of leverage on which Brazilian Jiu-Jitsu is founded allow a practitioner to pursue the art throughout their lifetime. Brazilian Jiu-Jitsu is beneficial in helping maintain cardiovascular fitness. Likewise, Brazilian Jiu-Jitsu has been compared to a human form of chess because of the fun endless strategies of technique and counter-technique via: armlocks, escapes, and chokeholds during class or in tournaments. Training helps develop different ways of thinking for the practitioner. Students are taught the importance of relaxation, balance, self-control and patience to be used in Jiu-Jitsu and as well as in life. Brazilian Jiu-Jitsu has proven extremely effective in law enforcement. The element of control emphasized in Brazilian Jiu-Jitsu provides the edge an officer would need to subdue and arrest a suspect. 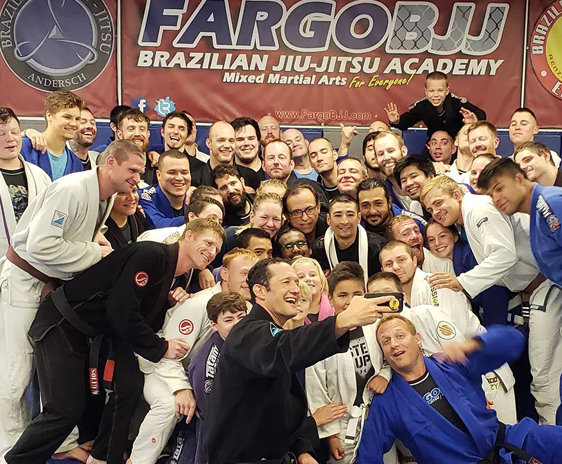 While most martial arts emphasize striking, Brazilian Jiu-Jitsu offers a more appropriate alternative for law enforcement. Police department studies have concluded that more than 90% of confrontations in the field end up on the ground. In this scenario Brazilian Jiu-Jitsu allows an officer to be comfortable and in control of a situation. Brazilian Jiu-Jitsu also known as “combat wrestling” has become the prototypical system for training in most police academies. Two goals for almost every martial artist are to be as well rounded and prepared as possible when confronted with a self-defense situation. Brazilian Jiu-Jitsu was confined to Brazil for nearly a century. With the introduction of the Ultimate Fighting Championship (UFC) in 1993, an awakening occurred in the martial arts community. Before the UFC most individuals’ frame of reference for martial arts came from movies and television. With the introduction of the UFC (in its original format, with no time limits or rules) everyone was able to see martial arts presented in a realistic context for the first time in America. The success of Brazilian Jiu-Jitsu in the UFC convinced many practitioners of other martial arts that by understanding Brazilian Jiu-Jitsu they would be better fighters and martial artists. Today to compete in the UFC all fighters must have an understanding and training in the Martial Art of Brazilian Jiu-Jitsu. There are 3 different methods of training Brazilian Jiu-Jitsu: Self-Defense training, Street-Defense training, and Sport-Tournament training. This type of training involves the ability to handle standup aggression and defend oneself from a physical attack on the ground or from a weapon such as a knife, gun or club. Brazilian Jiu-Jitsu’s self-defense addresses the most realistic attacks that occur on the street. Students are taught how to control the situation before the attack happens. Yet if an attack comes Brazilian Jiu-Jitsu will allow the student to use simple escapes and attacks geared toward controlling and finishing an assailant with submission holds. Since the holds are based on leverage, the student has the ability to use as much pressure he or she wishes to implement. In self-defense and in matters of the law it is not always the best option to strike back because you cannot punch someone soft. Brazilian Jiu-Jitsu gives many options to deal with an attack without striking; however, the system does teach striking from superior positions. Since Brazilian Jiu-Jitsu was developed to reflect real fighting on the streets of Rio de Janeiro, Brazil, this aspect of training will teach how to defend oneself, for lack of better words, in a street fight. In Brazil the word “vale tudo,” which means anything goes is the concept that structures class training. A student that enters a vale tudo class will learn how to take a person with superior striking abilities down to the ground, control the person, and finish the fight by submission, striking, or by verbal command. Brazilian Jiu-Jitsu has changed the way martial artist train because of this form of training. It is understood that you can’t have a safe class lesson with people punching and kicking each other, so in this class you will get very close to fighting by focusing on the little details of street fighting positions without hurting one another. In doing this, the student will learn what is real and practical instead of what could be real and is pure fantasy. During this aspect of training, students learn the many Sport Jiu-Jitsu techniques and strategies. Students train with the uniform (Gi or Kimono) on and learn takedowns, throws, ground-positions, escapes, attacks and endless strategies. This is a fun way to explore Brazilian Jiu-Jitsu for the students that aren’t interested in fighting. Also, all the techniques can be used in Brazilian Jiu-Jitsu tournaments that have safe rules and weight classes for children, women, and men. Another aspect focused on is training without the uniform. Students are taught Brazilian Jiu-Jitsu without relying on the uniform for control. 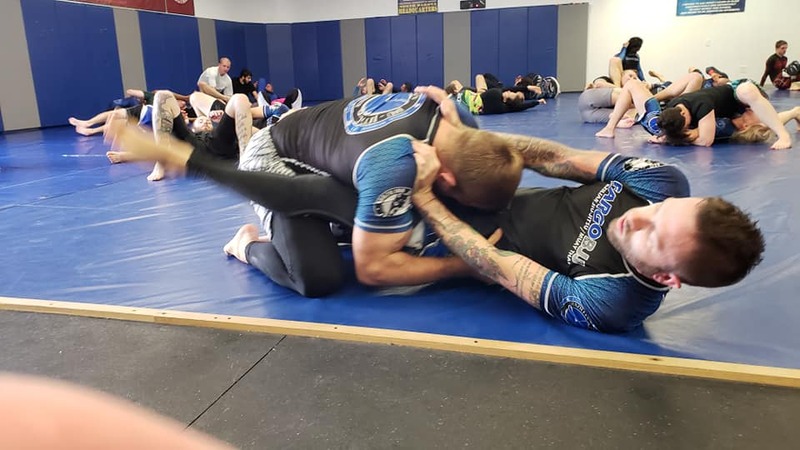 This way of training is similar to wrestling, but instead of trying to pin the person as in wrestling, training is geared toward finishing the opponent with submission holds.